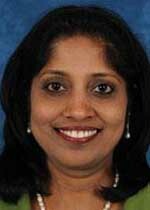 Miss Rajeswari has been a consultant Obstetrician and Gynaecologist at Ashford & St Peter’s Hospital NHS trust since 2008. Miss Rajeswari completed her postgraduate training in Dublin and London. Miss Rajeswari’s interest is in General Gynaecology especially with regards to pelvic pain and discomfort, prolapse, pelvic floor disorder, endometriosis menstrual disorders, heavy or irregular bleeding, HRT all problems connected to menopause which can be a great source of distress to women. Effective treatment can dramatically improve quality of life. Miss Rajeswari has special interests in Polycystic ovarian disease which can affect the menstrual cycle and fertility of a woman. Miss Rajeswari also performs Colposcopy and carries out treatment in women who have abnormal cervical smears. Miss Rajeswari’s special interest in Obstetrics is diabetes and other endocrine disorders during pregnancy. She also offers pre-pregnancy counselling for women with diabetes which aids in improving pregnancy outcome. Miss Devanna Rajeswari does not hold a share or financial interest in this hospital, another Nuffield Health hospital or the company. Miss Devanna Rajeswari does not have a share or financial interest in equipment used at this hospital or another Nuffield Health hospital. Miss Devanna Rajeswari does not hold any paid advisory role(s) at this hospital or on behalf of Nuffield Health.